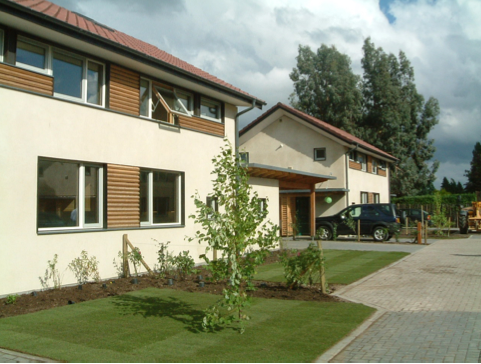 Greenoak is a small independent housing association based in Surrey and Sussex. Previously the association took ownership of developer-built houses on mixed develop- ments, but three new self-developed schemes gave the association the opportunity to address sustainability from scratch. In 2002, they commissioned the design of a 14 house development in Dartmouth Avenue, Woking. This was completed in March 2005. It was followed by 12 houses in Glaziers Lane, Normandy, Guildford, completed in July 2005. A third scheme of 12 houses in Storrington, W. Sussex was completed in 2009.